The current division of Cyprus on supposed Greek-Cypriot and Turkish-Cypriot identity issues is historically both a fallacy and a tragedy. From the outset, Cyprus is Cyprus, irrespective of there being Greek-Cypriots, Turkish-Cypriots or any other sort of prefix-Cypriots you care to identify. Inclusive, non-ethnic Cypriot nationalism, also known as Cypriotism, focusses on pan-Cypriot unity, in stark contrast to the ethnocentric counter-narrative that has unnecessarily divided the island for too long now. The geopolitical world as we currently view it is littered with the hang-over of artificially created fault-lines of division, more often than not based on imperial interpretations of ethnicity. Unfortunately, nineteenth and early twentieth-century European imperialism was a potent, infectious thing. Furthermore, wherever it took root, at some point before it then subsequently inevitably died. Artificial, arbitrary borders were often implemented almost in testament to its ultimate folly. Modern-day Africa, the Indian sub-continent and the partition of Ireland are probably the three most famous, but not exhaustive, examples. Cyprus has also experienced the same. Ever since the island fell under the British Protectorate of 1878, ethnicity has been used as a means to keep the island of Cyprus in check and in passive submission. Divide and conquer never seemed more apt. It is though worth taking a short while to look into the idea of there being two separate Cypriot identities. The expressions of Greek-Cypriot “Enosis” historically clash heads with the Turkish-Cypriot shout of “Taksim“. Enosis is the call of Cyprus to unite with Greece, while Taksim is the Turkish-Cypriot expression of a divided Cyprus with a benevolent eye towards Turkey. Yet nothing shouts louder than “Cyprus Belongs to its People” and by “people” that means all of them, regardless of history or an arbitrary dividing Green Line now or in the future. Consequently, upon examination, the examples of Cypriot nationalism, transcending the tired drum-beat of artificial ethnocentric divides, are many. First up, genetically, it is a worn-out myth that there are Greek-Cypriots and Turkish-Cypriots, defined by blood or DNA. Long before the division of Cyprus and indeed long before the British protectorate, the Linobambaki were Cypriot Christian communities that had incorporated elements of Islamic culture following the Ottoman invasion and subsequent rule of the sixteenth century, yet still retained their original identity. The Linobambaki are an inspirational precursor to modern-day Cypriot nationalism for Turkish-Cypriots, as they show how they were able to effectively bridge the division between two different prominent cultures in Cyprus – a telling precedent for Cyprus today. Consider also the revolt of Gavur Imam in 1833. Imam was a Turkish-Cypriot origin, who is likely to have belonged to the wider Linobambaki community. Gavur Imam took exception against the imposition of unjust taxes by the Ottoman authorities (echoes of the American Revolution maybe?) and led a popular movement against the unfair tax. Gavur Imam’s great revolt was supported by both Turkish-Cypriot and Greek-Cypriot communities, with all Cypriots fighting against Ottomans together, side by side. While Gavur Imam’s rebellion eventually ran out of steam, the legacy of proto-Cypriotism was created and maintained to this day. Moving on into the twentieth century, one also needs to have an appreciation of how the British imposed an exaggerated view of ethnocentric nationalisms on the island in an effort to bolster its rule and quell dissent. Britain had annexed Cyprus to its Empire in 1914, with the outbreak of the First World War. Prior to that, it had administered Cyprus as a protectorate, so technically a part of the Ottoman Empire, since 1878. After the Second World War and into the 1950s, a majority Greek-identifying Cypriot movement agitated for Enosis, union, with Greece, at the expense of British rule. Consequently, as a counter-balance to that, London unofficially promoted the Taksim philosophy held by some Turkish-Cypriots, that of the effective, de facto ethnic division of Cyprus. However, there was only so long that Britain could hang on to its post-War imperial pretensions. Consequently, Britain granted Cyprus its independence in 1960, while still maintaining two military bases there, following years of Cypriot agitation against rule from London. A subsequent post-independence uneasy peace held sway over Cyprus until 1974 when the newly formed Greek military junta in Athens declared all of Cyprus to be part of the Hellenic (Greek) Republic of Cyprus. Ankara responded swiftly to this pseudo-fascist land-grab, sending in troops twice and roundly defeating their Greek foes before hostilities were brought to a halt. In the ensuing peace negotiations, Cyprus was partitioned and approximately 36% of the island became today’s self-proclaimed “Turkish Republic of Northern Cyprus”. That division remains to this day. It is an entirely reasonable suggestion to make that the 1974 division of Cyprus found part inspiration in the earlier British blueprint of exaggerating ethnic division within Cyprus. Interestingly, following the Turkish invasion of 1974, friction flared up between the island’s indigenous Turkish-Cypriot inhabitants and predominantly farmer-settlers from mainland Turkey who were encouraged to move to Cyprus to take up roles that had been vacated by the vanquished Greek-Cypriots. So it would appear that, once again, there is no natural synergy between mainland Turks and Turkish-Cypriots. Next, what of the internationally recognized flag of Cyprus? Created in 1960, following the London and Zurich Agreements, the flag of Cyprus is unique in that it is the only flag of all the nations of the Earth to show an actual geographical map of the country in question. The designer of the flag was a “Turkish-Cypriot” art teacher, Ismet Güney, who specifically ensured that the flag was set on a white background, for peace, and underscored by two olive branches, again representing peace. In stark contrast, those Greek-Cypriots in favor of Enosis will fly the sky-blue-white of Greece, while Turkish-Cypriots who advocate Taksim opt to fly the flag of the self-proclaimed Turkish Republic of Northern Cyprus. 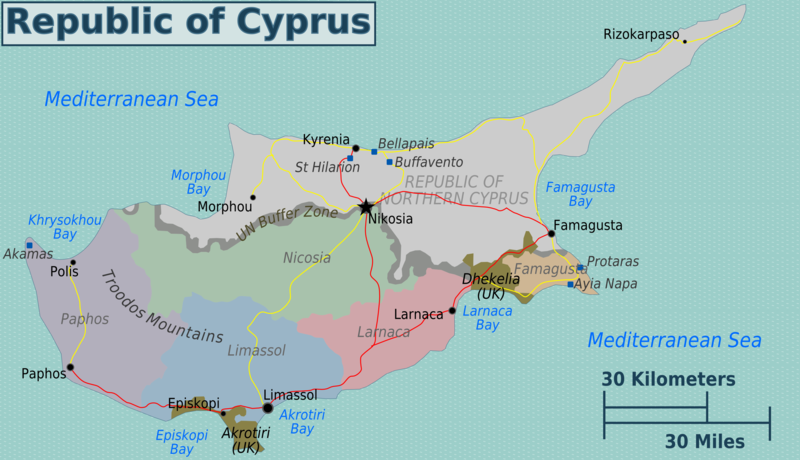 In the political sphere of Cyprus, a number of political parties and organizations, on either side of the “Green Line”, support Cypriot nationalism as opposed to ethnocentric Greek-Cypriot of Turkish-Cypriot allegiances. AKEL, The Progressive Party of Working People, is a major political party that is active in Cyprus. It is the oldest and at times the largest of the Cypriot political parties. The party remains steadfastly committed to the emergence of a united, independent, demilitarized and progressive Cyprus into the future. Similarly, in occupied northern Cyprus, one finds WUTC, the World Union of Turkish-Speaking Cypriots. WUTC is a London-based organization mainly doing lobbying activities. Since today, as the vast majority of Turkish-Cypriots immigrated to the United Kingdom because of the oppression of Turkish authorities against them, it is clearly justified why this organization is considerably well-known, fighting for their rights. It is active in occupied areas of Cyprus and it constitutes a movement that is steadfast in its commitment to bringing to an end what it sees as the wholly illegal Turkish occupation of northern Cyprus and simultaneously resisting Turkey’s exploitation and abuse of Turkish-Cypriots prior to that. Notable incidents on recent years show the latent potency of Cypriot nationalism, never that from the surface. In January 2011, a rally took place in north Nicosia by Turkish-Cypriots, protesting against the heavy-handy policies of the Turkish government towards them. Commonly known as the Communal Survival Rally, the response of Turkey’s Prime-Minister Erdogan to that was so ridiculously aggressive that led to additional rallies erupted in March and April the same year, with even bigger crowds of up to 80,000 people. It is a well-known fact that today, the Turkish-Cypriot population that remained in the island is also around 80,000 – 100,000. So in the light of this information, we can easily say that almost every Turkish-Cypriot attended the Communal Survival Rallies organized against Turkey in 2011. This is a pan-Cypriot issue that is not going away and consequently, fast-forward a few years to 2018. In January of that year, the Turkish-Cypriot newspaper, Afrika, ran an article criticizing the Turkish governments’ military foray against Kurdish-held city of Afrin in northern Syria. The Turkish nationalist Grey Wolves took violent umbrage at the article and attacked the offices of Afrika. The backlash against this mob-rule tactic implemented by the Grey Wolves, with a tacit nod and a wink from Ankara, was met by thousands of Turkish-Cypriots again demonstrating against the over-bearing influence of Turkey. Unfortunately, a sizeable majority of the people of Cyprus find themselves like a tug-of-war competition between two powerful, culturally magnetic countries – Greece and Turkey. But there is really no need for that tug-of-war match to even be taking place. Turkish-Cypriots identify themselves as being much more secular and progressive than mainland Turks. That socio-cultural difference then manifests itself in the failed assumption that Turkish-Cypriots will always tow the Ankara line – when the situation is actually far from it, as recent demonstrations and popular opinion have shown. Similarly, a growing number of Greek-Cypriots are coming around to the idea that the answer to Cyprus’ future is not longingly looking across the Ionian Sea to Athens, but rather for Cyprus to unite and make its own destiny as an island, with one people. That peaceful flag of Cyprus may end up being way more influential than people have previously thought. Interesting Article. I worked in Cyprus for 12 months a few years ago and my Cypriot friends considered a real loss from the partitioning was that they couldn’t drive to Kyrenia in an afternoon for coffee. For those who want a more intimate view of the partitioning, they should read Bitter Lemons by Lawrence Durrell. Bella Caledonia could do a similar article on the partitioning of Ireland. I agree. I’ve read ‘Bitter Lemons’ several times since I came to live here. It truly is a wonderful, moving account of those times and just makes me even sadder at the fate of my adopted home being in the hands of others. Unfortunately, the fate of Cyprus will probably never be left to Cypriots – of any sort. There are too many external vested interests : namely the UK, US, NATO and EU. I remember the referendum here in 2004, when the Annan Plan was rejected by voters in the Republic and accepted by those in the ‘TRNC’. At the time, those who voted against were berated even in Greek Cypriot newspapers as having lost the best chance they had of recovering at least some of what the invasion of 1974 (which, BTW, was known about and nodded at by US and UK foreign offices) had cost them. However, the plan was deeply flawed and, far from being fair and reasonable, was the result of secret diplomacy which excluded the people of the island. Cyprus is one of the NATO powers’ favourite political footballs and the people here seem to be doomed to watch the game from the sidelines. I have just finished reading Trial of Henry Kissinger by Christopher Hitchens. Chapter on partition of Cyprus in1974 gives good background on geopolitics at time. A brilliant, absorbing article that fills me (a recent immigrant with dreams of becoming a Cypriot) with hope. Alongside extreme nationalism, religious intolerance must also be overcome if we are to enjoy Cypriotism. Stories from the past where ethnicity and religious beliefs did not colour relationships are often heard, so it is not a pipe dream. Thank,you for this article . The Greek Cypriots gave up the idea of Enosis many years ago . They much prefer to be an independent people . Unfortunately we have the occupation, which the governments should think seriously how they should start negotiations. I feel that neither side of the population want a solution.